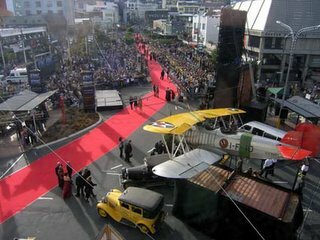 I managed a birds-eye view of the red carpet at the New Zealand premiere of King Kong. Not a ticket to the actual premiere unfortunately, but I was watching from the 2nd floor of the Embassy Theatre where it was being screened. 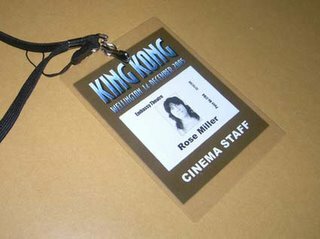 The Film Festival office is up there, hence the special staff security pass (I have one from when Lord of the Rings screened too - nice memento). I spent my time critiquing the fashion faux pas and picking out the celebrities whilst knocking back a few glasses of bubbles. Jack Black wasn't there but Jamie Bell, Naomi Watts and Adrien Brody were. I nearly didn't recognise Peter Jackson - he's such a shadow of his former self. He wasn't wearing the usual purple shirt - I guess it's too big for him now. Wowie-lot's of fun! Oh i wish jack Black would have been there-a very silly man. And i was commenting about Peter Jackson just the other day. My husband said you wouldn't recognize him. jackson said in an interview it was stress and his diet. that's far too much stress in my opinion. Critiquing fashion fuax pas-that sounds escpecially fun. Dave and I chatted to Jack Black one night at a Bonnie "Prince" Billie gig. I think these actors quite like hanginig out in Wellington - no papparazzi, no annoying people wanting autographs. Everyone knows who they are but I think it's part of the New Zealand pysche to be laid back about these things. He seemed like a nice guy. He was crazy about Will Oldham. It was a good night. Sweet. Looking forward to seeing King Kong.